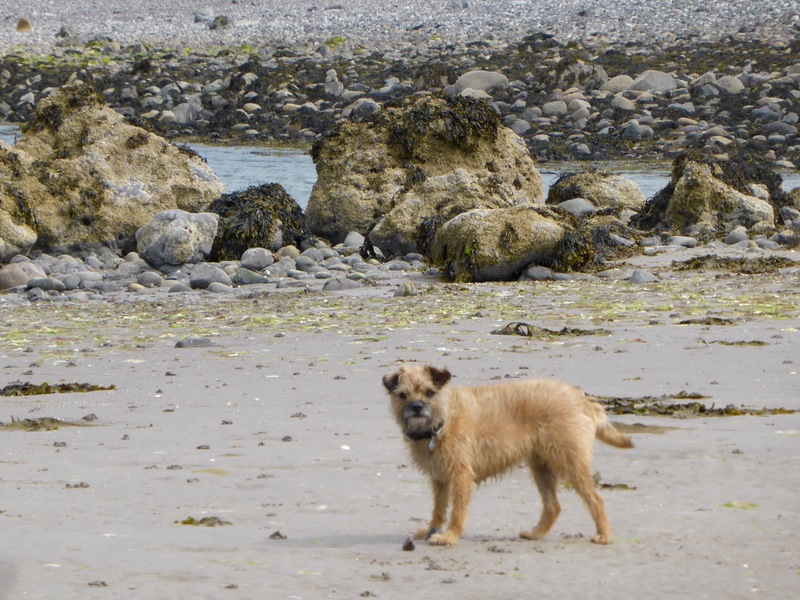 The little things….. – Mrs Marina Starke likes…..
Today I took my dog to the beach. Now that is not an unusual thing, but today I tried to do just that. No ‘phone, no photos, no posting. Just me’n’B, walking, watching , listening. Enjoying her pleasure at simply being there. My dog smiles. Disclaimer, this is blatant anthropomorphism on my part. She’s a terrier, her mouth is just made like that and anyway she expresses delight from her other end. But her smiley face lifts my spirits. So back to the beach and maybe at first little MissB is looking for something else too, but I’ve brought no balls so it’s just running and sniffing and maybe digging up some treasure. The tide is low today giving us a lot more beach than last time. More sand, more seaweed, more stones; so many different types of stone; slate, granite, quartz, smooth, crusted, hairy. The smooth ones are great for bowling along the sand, B in hot pursuit. The splash and sift of the sea on the sand, children’s voices, the thunder of paws – for a small dog she can make quite a din. It’s a week day, a work day, the children are here on a trip from school, learning to climb the cliffs. Last time the sun shone, it was a holiday, I filled a big shopper full of rubbish as I walked. I’d found the shopper tucked into the rocks. A couple of tourists joined in, horrified by the mess. There’s a different couple today, taking pictures, enjoying the almost pristine beach, but all that plastic didn’t just end up in my bag. It’ll visit some other shore. Just for a moment, banish that thought. Just for a moment, be in the moment. Having fun, with my dog, on the beach. PS. Towards the end, I cracked. I took some photos.